Living, Loving and Lying Awake at Night is a collection of short stories set in apartheid South Africa. Divided into two parts. Part one is a collection of interlinked narratives of African women who were enslaved as housemaids in the houses of their white madams and masters. While, the second part is a collection of short stories along the same line. considered as an employee. And what is more, they were obliged to move around with a "Pass", without which they were harassed, abused and finally arrested by the police. In fact, they were enslaved in their own land. "We live in hope of living one day. But the one day never comes and we die poor, hoping still." "Living, Loving and Lying Awake at Night" is a page turner and an insightful novel that offers a glimpse into the degree of inhumanity inflicted upon African people during the racial segregation in South Africa. It narrates on the atrocities committed against them, which marked their lives with violence and exploitation as they lived in constant oppression, tyranny and hopelessness. Obviously, the stories were tragic and full of despair. 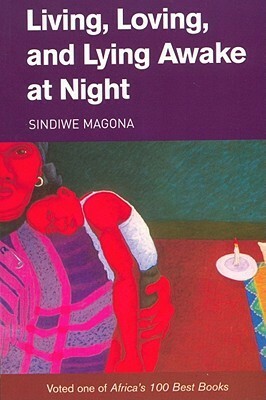 I admire Sindiwe Magona 's talent and courage for writing such novel. I read somewhere that she too worked as a housemaid before becoming a writer. I look forward to reading her other novels: Mother to Mother, To My Children's Children, Beauty's Gift and Forced to Grow. I found out about her in African Love Stories with her short story "Modi's Bride". Have you read any of her novels? Thanks for introducing me to another interesting author. It is my pleasure. Thanks for stopping by. Sounds like an important story that needed to be told. Thanks for highlighting the book, Mary. Sounds like an important story that needed to be told. Thanks for highlighting the book, Mary. Keep up the good work. Hey Tolulope, actually it is an important story indeed to be told. Honestly, our recent history is very depressing. Apartheid was a mere 20 years back. Not so long ago, african women was still tortured. *Sigh* very sad! most stories were actually very depressing. But they needed to be told. And luckily they lived to tell it.